Hotel Leela Kempinski, situated at a distance of 15 kms from Thiruvanathapura Airport is largest resort in “gods own country' Kerala. The resort with an area of over 44 acres has 182 guest rooms and suites. The Leela Kempinski is beautifully snuggled between two pristine beaches offering incredibly scenic view of the Kovalam beach. Hotel Leela Kempinski is a wonderful wedding venue as it offers some striking locations for couples to tie the nuptial knots. 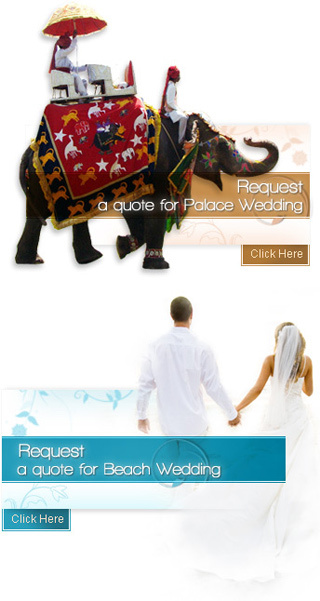 There are five wedding venues at resort including banquet halls, lawn and beach area. Rajiv Gandhi Convention Center has a capacity to accommodate 900 persons in a theatre sitting arrangement, 300 persons in classroom sitting arrangement, 250 persons U-shaped sitting arrangement, 900 persons In Cocktail and around 400 persons in round table sitting arrangement. This hall is ideal for big weddings. Another banquet hall Maya can accommodate 70 persons in a theatre sitting arrangement, 45 persons in classroom sitting arrangement, 35 persons U-shaped sitting arrangement, 80 persons in Cocktail and around 40 persons in round table sitting arrangement. This hall is ideal for small weddings. The third banquet hall Pandal can accommodate 600 persons in theatre, 350 persons in classroom, 1100 persons in U- shaped, 500 persons in cocktail and 200 persons in round table sitting. This banquet hall is good for big weddings. The beautiful lawn of the hotel can accommodate 45 to 75 persons. The beach area of the hotel can accommodate anything 100 to 200 persons. The Leela Kempinski Kovalam Beach has 182 well furnished rooms equipped with all the modern amenities. The terrace of The Leela Kempinski Kovalam Beach is a good place to palate some Oriental, Continental and Indian delicacies in addition to authentic cuisines of Kerala.